New to Xojo and looking for guidance? The folks at xDev Magazine have been writing about how to use Xojo for over a decade -- long before it became Xojo. Each bimonthly issue of the magazine is packed with in-depth features, tutorials, and regular columnists. Plus we keep you up-to-date on news in the Xojo community. We're primarily a digital publication now (back issues are collected into printed books if you prefer print), and our PDF edition is ideally formatted for digital reading on iPads and tablets. 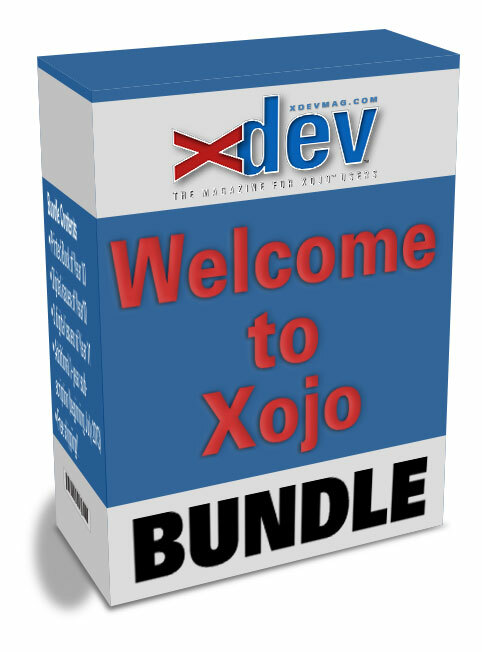 To welcome you to the exciting world of Xojo programming, we've put together a terrific bundle. This bundle includes six back issues of the magazine, plus a one-year subscription so you'll be learning all about Xojo for the next year. It's the perfect way to get started programming with Xojo. And you save as much as 34% over the non-bundle price! That's a total of 12 issues of the magazine -- two years worth of great learning! You get some previously published material to get you started, plus a new subscription to keep you reading for the next year. It's perfect! Bought individually these items could cost as much as $130 (depending on the cost of shipping the book to your location), but with this special bundle you can save up to 24%: the Welcome to Xojo bundle is just $99 with free shipping of the book! But you must hurry: we only have a limited supply of the printed Year 15 book and this offer may end at any time. Take advantage of the savings and order today. Bundle price is just $119.99 $99! This special bundle includes a 500+page perfect-bound printed book of all the issues of xDev Magazine magazine published in year 15 (15.1 - 15.6, January 2017-December 2017. The book is black-and-white interior and a full-color cover. Shipping is included. The offer also includes digital (PDF) issues of Year 16 of the magazine. A new one-year PDF subscription to xDev Magazine is also included, beginning with issue 16.1 (Jan/Feb 2018). You must include your email and mailing addresses with your order. For Academic Packages, please see our Order Page. Our Academic products are already generously discounted and do not qualify for additional discounts. For our other products, such as CDs, books, and PDF back issues, please see our standard order page. Feel free to mix-and-match items simply by placing them in your shopping cart! Important Note: xDev Magazine (formerly Real Studio Developer) is published by DesignWrite. If you purchase from our store with a credit card, it will show DesignWrite on your credit card bill.